Senator Romeo Dallaire, the Canadian general who led the overwhelmed UN peacekeepers during the 1994 Rwandan Genocide, made a promise the night he left Kigali. “I promised never to let the Rwandan Genocide die because I knew the Rwandans didn't have much power internationally and certainly didn't have the resources. I felt it was my duty having witnessed it, and having stayed to witness it, that I had to talk about it and keep it going,” Dallaire told Huffington Post Canada. “So there's been a certain success with that from writing a book ('Shake Hands With The Devil: The Failure of Humanity In Rwanda') and the second one ('They Fight Like Soldiers, They Die Like Children') -- it has a child soldier side to that but it's based on the Rwandan experience -- and having the lecture circuit and all kinds of other things (like the) movies, all that has been very positive." But by movies, he sure doesn’t mean the Oscar-nominated "Hotel Rwanda." While he’s proud of both the documentary and Emmy-winning TV-movie based on "Shake Hands With The Devil" he is no fan of the most famous film to emerge from the carnage, despite inspiring the character in it played by Nick Nolte. 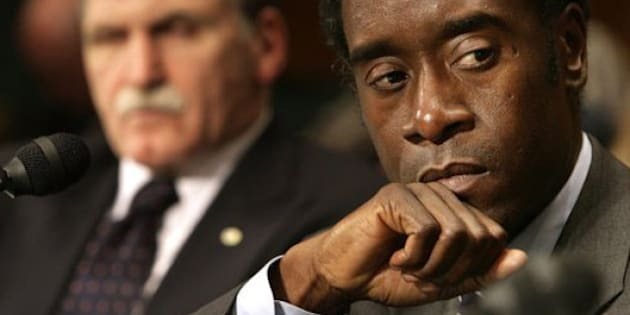 When Dallaire spoke to us at a We Day youth rally in Waterloo last month, Paul Rusesabagina, the inspiration for the protagonist of "Hotel Rwanda," played by Don Cheadle, had just cancelled his own appearance at Winnipeg’s We Day event later that month. Rusesabagina’s withdrawal came on the heels of protests over his receiving the Lantos Foundation for Human Rights and Justice Award, an honour that had previously gone to the likes of the Dalai Lama and holocaust survivor Ellie Wiesel. While the 2004 film painted Rusesabagina as the savior or more than 1,200 people who escaped certain death at the UN-protected Hôtel des Mille Collines, Rwandan groups have since accused him of revisionist history, genocide denial and profiteering off the refugees he sheltered. Though Dallaire declined to address the Rusesabagina controversy directly -- aside from saying it was very good he cancelled or “I wouldn’t be here” -- he had no qualms about attacking "Hotel Rwanda." “The story is skewed and we didn't need that. Philip Gourevitch wrote an excellent book (‘We Wish To Inform You That Tomorrow We Will Be Killed With Our Families’) from which they extracted him, but I think that the facts were not necessarily well-researched,” he said, albeit adding that the film’s revisionism could also be useful.